A day of trains and cars. First things first, yes Rob had two eggs on toast and I had a cheese and onion omelette. 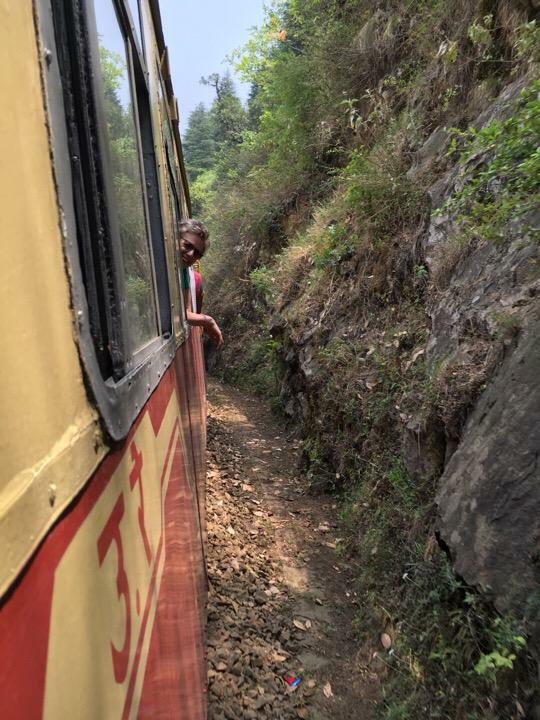 We were being collected at 9:45 to be taken to the UNESCO world heritage toy train from Shimla to Kalka. We were slightly early and confused our poor guide and drivers by walking to the station. In India of walking or going by train when there is a perfectly good car throws them into deep confusion. Once on the train and showing away the usual fighting monkeys we settled down. It didn't take long into the journey for Rob and I to start train hanging and siting with feet out as the train rattled down the mountain in s very pleasant way indeed. Every so often the train would wait at a station for an up train to pass and we would get off to stretch our legs. We even got sufficiently confident (well I did, I won't talk about chicken Barker) to wait until the train started to move off from the platforms before getting back in. At one station I even plucked up courage to buy some of the food being hawked around and had a very pleasant vegetable pakora. Of course Rob was persuaded to have some. After 4 hours we arrived near the bottom and completed the rest of the journey in the cars which had driven down with our bags much quicker than we managed. Once at Ambala station we waited on the platform in amongst the sea of humanity which is an Indian railway station, complete with the odd rat running around. Long train ride to a very smelly station then dash through a sandstorm and into the hotel just after midnight.